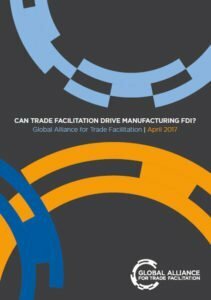 Home » Publications » Can trade facilitation drive manufacturing FDI? Can trade facilitation drive manufacturing FDI? This paper examines the relationship between the trade facilitation environment and the level of foreign direct investment (FDI). It highlights that developing economies with stronger trade facilitation environments attract high-value investments, especially in industries such as auto parts and aerospace manufacturing. Foreign Direct Investment (FDI) has been crucial to the success of manufacturing in emerging economies in East and South East Asia. Here, FDI has been shown to have incredible potential to support job creation by supporting economies’ integration into complex global value chains. For instance, Sri Lanka has attracted over US $1 billion in manufacturing FDI since 2011. This accounted for less than one third of total investments in the country, yet constituted more than two thirds of the total job creation from FDI. Meanwhile, however, other countries have missed out on this investment. This report finds that these countries also tend to have higher trade costs and more burdensome trade requirements. More specifically, the report finds that improving the trade facilitation environment by 1% corresponds with a 3.2% increase of FDI into manufacturing. While this does not imply causation, the report argues it points to the importance of trade facilitation in attracting and retaining investment. Developing economies with strong trade facilitation environments were also found to attract high-value investments, especially in desirable industries such as auto parts and aerospace manufacturing.